Just a quick post tonight. 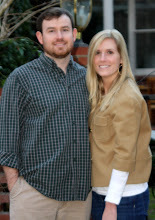 Over the weekend another blogger, Julee Turner, lost her husband in a car accident. They're from Arkansas and although I've never met Julee, I've followed her blog for quite a while. Her husband, Matt, was a TV anchor in Arkansas and they'd recently moved closer to where they were from. They have the most precious little girl, Preslee, who will be one in November. I cannot fathom what she's feeling right now. We're praying for Julee, Preslee, and their families. If you're interested in how to send help for Julee, click HERE. We're lifting them up in prayer today and in the days ahead.